Probably the only surviving picture of fleet number 68 registration CNM 43 chassis number 10337 taken just after withdrawal in 1952. Luton Corporation Transport purchased a fleet of Daimlers in the early 1930’s to replace the tramway system that had served the town for a number of years. I suppose the thinking was that ex tram drivers would be able to come to terms much easier with semi automatic pre-selector gearboxes and fluid flywheels than the crash gearboxes offered by other manufacturers. These were mated to Gardner 5LW engines which on the face of it seemed rather small to haul these machines up the steep inclines each side of Luton town. Many of these old Daimlers soldiered on into the 1950’s despite sketchy wartime servicing and the Luton bus garage receiving a direct hit from a Nazi bomb. The low bridge Willowbrook coachwork had much character with the unusual feature of an upstairs with one gangway each side of a raised dais giving each bench seat only three places instead of the usual four. This meant that whichever side you sat downstairs you would still risk banging your head. The drivers cabs were also a bit claustrophobic and had a small box section let into the roof to accommodate tall drivers. For some reason the Gardner 5LW engines were much quieter in these compared to the Eastern National Bristol’s that also ran into Luton. Perhaps the fluid flywheel had a cushioning effect or maybe they had flexible engine mounts. In any case one characteristic of the Bristol’s was that each window would vibrate in turn as the engine revs gathered pace. One notorious hill that tested these Daimlers to their limit was Crawley Green Hill to the east of Luton. I worked for Vauxhall Motors in the 1950’s and would sometimes wait at the top of this hill to catch a bus to Stopsley. The water supply in Luton contains a high proportion of chalk and no doubt this was used to top up their radiators. This resulted in a well laden bus boiling at about halfway up this hill and the driver having to switch on his wipers to clear the screen of condensed water. You will notice that number 68 has the engine side panel leaning against the wing in the time honoured way to give an extra cooling effect. Despite this the drivers cab would be writhed in steam at the top and a short wait would be required to cool them down. At tick over and in neutral they would emit a ‘wind in the willows’ whine that would stop abruptly as first gear was engaged. As the driver put his foot down the bus would shake slightly as the fluid drive began to bite and to the sound of creaking coachwork the bus would slowly move forward like a dowager duchess perambulating at a garden party. I love John’s wonderful literary description of the characteristics of these most interesting vehicles – a batch which, incidentally, I’ve never encountered before. While three window upper saloon windscreens were fairly common before WW2, this particular arrangement is most unusual and has the suggestion of the bay windows in many houses. The phenomenon of "each window vibrating in turn" was also frequently evident in the Leyland TS and TD diesel models, particularly when setting off in second gear. Sadly there are few, if any, such controlled acoustic delights in today’s "sophisticated" offerings. Come on, Chris. Yorkshire folk tell it as it is. …..in today’s characterless sewing machines! John Barringer Great to see these old photos surfacing even when not my ‘location’ I must explore more of the website. A very evocative description that takes me back, too! Luton dabbled with Willowbrook bodywork for much of the 1930’s, but these were the last of the breed. They all went between 1950 and 1954. The double gangway certainly restricted the seating capacity, the full code being L26/26R! I’d say that these buses were about the last of the bay-windowed breed, too, although Dublin were still ordering such fronted buses in the late 1940’s, if not a little later. Personally, I rather liked this style of front. The Bovril adverts are ones I’ve never seen before, and don’t make outrageous claims, either! I’m very pleased to see this as I was about to post a question regarding pre-war Willowbrook bodies with the upper deck arrangement which John describes. In an article about Mansfield Independents in Buses Extra in 1985, Roy Marshall recalls that Ebor had some of these, with a continuous sunken gangway which allowed the conductor to work round the top deck in a circle. Now, try as I might, I just cannot imagine how this was configured, how would it have been continued under the front canopy or over the rear platform? Do any plans or diagrams or even photos exist? 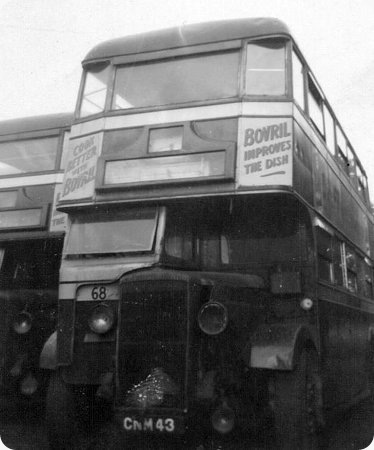 In the same article, Mr Marshall mentions that Trumans of Shirebrook bought a Guy Arab in 1946 and fitted it with a 1931 Park Royal lowbridge body on which the sunken gangway had been built up to normal height forward of the front bulkhead to meet postwar certification regulations, an accompanying photo clearly shows the area above the cab and canopy screened off by a series of handrails. My point is that on every lowbridge vehicle I’ve ever been on, the sunken gangway stops at the front bulkhead (i.e. back of the cab). Even if pre-war construction and use regulations allowed different, how would the driver get into the cab and surely driving would have been well nigh impossible! Did any other coachbuilders have a go at this layout or was it unique to Willowbrook? Interesting that 1937 Thames Valley Leyland double deckers had a 3-panel "bay window" upstairs at the front, but were bodied by Brush, years before any business connection with Willowbrook. The small outer windows of the Brush version were less angled than those on the Luton deckers. The TV buses had a conventional single sunken gangway, but I’m fascinated to see that Willowbrook used a double gangway as late as ’37! Chris Barker’s question exactly echoes one that’s been niggling me for years: how did you get from one gangway to the other??? A cross-gangway immediately behind the front bulkhead (front passengers downstairs Mind Your Heads!) would make sense, though it would entail a long circular tour for anyone nearside rear, but the view of seat-tops in the few surviving photos of double-gangway double deckers suggests otherwise. Another possibility might be to drop the last eighteen inches of the downstairs gangway, just aft of the axle, to platform level, so as to afford headroom for a cross-gangway upstairs over the platform, immediately forward of the stairs. This way everyone not sitting would get their allotted 5’10 1/2" of headroom, though tall folk would need to be careful as they boarded the platform. But here again the pictures don’t point to that solution. John Cupis, a friend who spent his childhood at Staines, Middlesex, tells me that on the London lowbridge STs there was a gap in front of the rearmost seat upstairs to allow you to cross between gangways, but that "you had to stoop" as you crossed. The Luton top decks look to be built as far forward over the cab as possible, presumably to accommodate the 9 rows of seats necessary to get 26 upper-deck seats. Thanks for the photo and detailed account of this very unusual and characterful batch. Luton Corporation always seemed to go for something different! A rare commodity indeed was the BET "Federation" style double decker. Single deckers were common, but there were few double deckers, the 3 window front top deck being a feature. Common with East Yorkshire, built by Brush and ECW. Also Thames Valley? YWD had a few. Who else? The Willowbrook body here has more of a bay window effect, as Chris points out, but perhaps was influenced by the BET ideas, although by no means a regular Willowbrook feature. That front upper-deck window seems particularly appropriate to the symmetrical double-gangway layout. Front seat passengers must indeed have felt as if they were sitting on a sofa looking through a bay window! The Daimler COG was years ahead of its time in terms of refinement. They did indeed have flexible engine mountings, and John’s description (apart from the creaking bodywork) could equally well apply to a Daimler CVG built many years later. Manchester bought COGs and CVGs from 1940 to 1963, and there was hardly any difference in the riding experience at all. I’m grateful to John Cupis for sending me photos, taken 60-odd years ago by the late John C. Gilham, of London Transport lowbridge STs, both outside and INSIDE! To read the rest of my comment and see the great shots click here. I suspect that this vehicle was already being used for spares as it has already lost one headlight. Did these buses ever have the engine side panel closed. I can imaging some of the drivers cursing the 5LW engine on Crawley Green as not only is it very steep, it is also lengthy and had a bus stop at the foot. A dead start on a Saturday lunch time outbound with a full load of seated passengers and probably another half dozen standing would mean 5 minutes climbing in first gear with speed probably in single figures. The pre-selector boxes made a wonderful, tuneful sound with variation of pitch, especially on overrun: and when stationary, they would have a distinctive "hunt" as a reminder to get a move on! Joe, unless I’m mistaken (I’m no engineer) I believe that the delightful symphony while standing, and it WAS delightful – in neutral – emanated from the fluid flywheel rather than from the preselctor gearbox. I’m sure you are right Chris- I should have said "transmission"! My father worked as a conductor for many years with Luton Corporation buses he received a gold watch for 25yr service but died shortly after receiving it.